A pair of architects achieve their goal of living in architecture in its most well-crafted form. 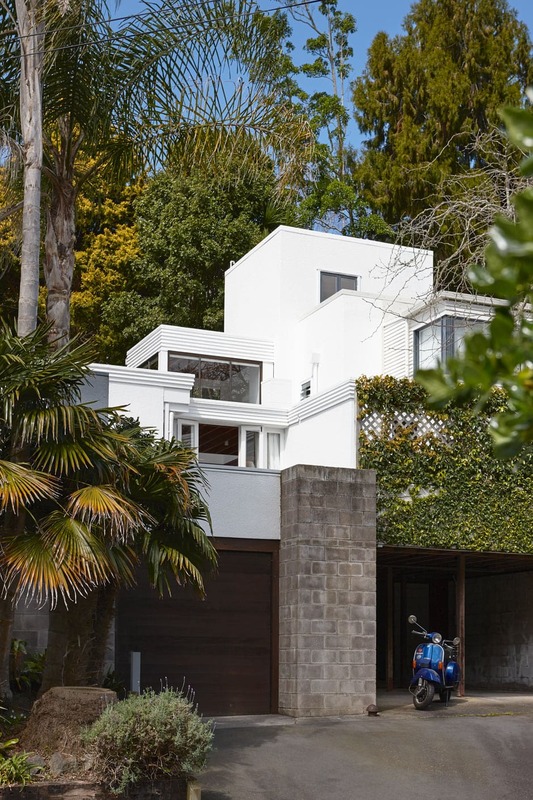 Tiny but mighty, this 74m2 home in Auckland’s Remuera punches well above its weight. It was conceived in the late ’60s, when artist Milan Mrkusich subdivided his land in this quiet cul-de-sac and asked architect Claude Megson to craft him a trio of rental units. 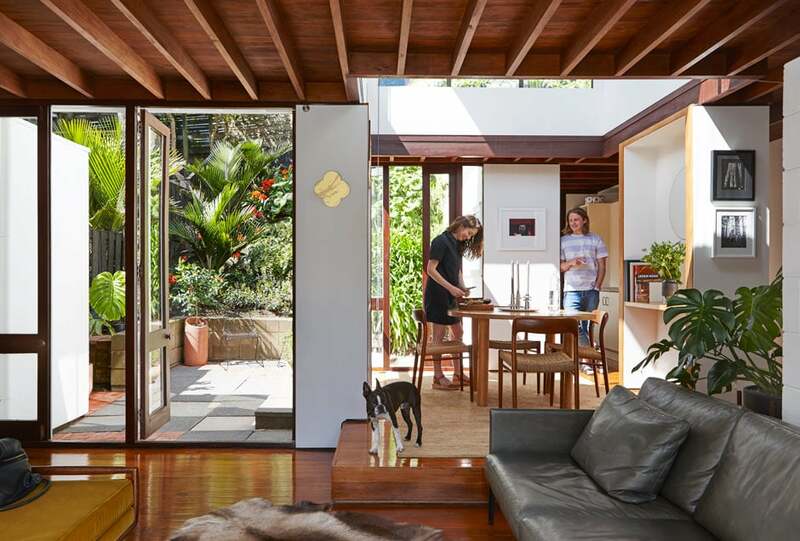 When Elspeth and Jimmy Gray, themselves both architects, spotted one up for auction on Trade Me in 2016, they’d almost given up on finding somewhere that captured their imagination. “We’d been looking for two years and had begun to think that anything that was ‘architecture’ was out of our price bracket,” says Jimmy. Ideally, the couple wanted a home with two bedrooms, but it took no time at all before they were convinced to downgrade on size to upgrade on experience. Here, the experience included the light that flows into the home, the many little journeys woven into the spaces, the peaceful street… It was a no-brainer. TOP It’s easy to draw parallels between the abstract geometries of previous owner Milan Mrkusich’s paintings and the cubist forms that make up this three-unit block. ABOVE Light beams through the ‘lantern’ into the elevated dining area where Elspeth and Jimmy prepare lunch. 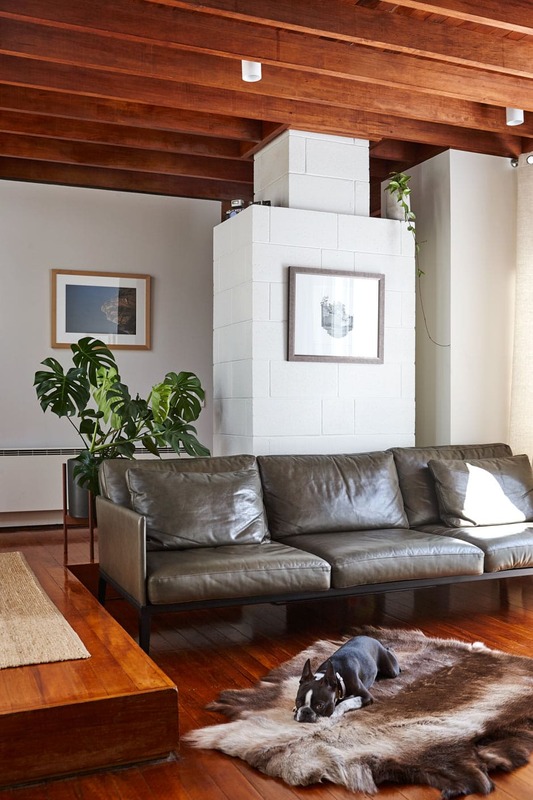 Max Gimblett’s Remembrance quatrefoil glows on the wall beside Brooks the dog. Having missed out on previous occasions, the pair put in a pre-auction offer, and after an anxious wait, the Megson was theirs. They ordered the original drawings from the council (“It’s amazing how few of them there were, in comparison to what we have to submit nowadays”) and studied the corners and crannies of their new home in physical and illustrated form. Megson’s genius was his wonderful understanding of volume and labyrinthine planning that pushed spatial interest into the spotlight. This home is a microcosm of those ideals. Central to the layout is a dining area that sits podium-like beneath a double-height atrium. 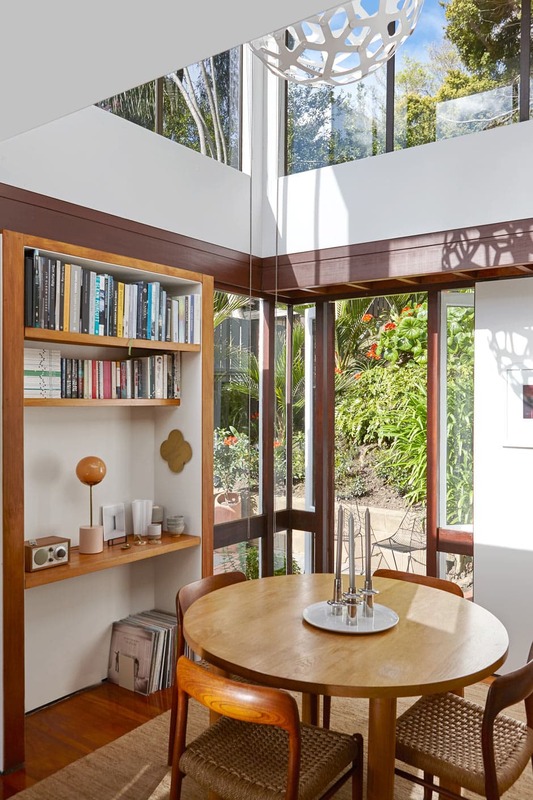 The morning sun floods through this ‘lantern’ into the kitchen and gradually moves around to the evening spaces.“Megson believed in the light following you as you went about your daily routine,” says Jimmy. At night, with the white blinds pulled down, shadows from the couple’s David Trubridge pendant pattern the void. TOP The All Circle dining table by Douglas & Bec is teamed with Model #75 chairs by Niels Moller. ABOVE A Liaison sofa by Nonn sits in front of the decommissioned fireplace decorated with a collage by Jimmy’s sister Georgina Gray. Access to the one-bedroom home is via a vertiginous narrow staircase that leads from the carport between concrete-block walls before the space funnels out, or up from the street across the deck to the front door. 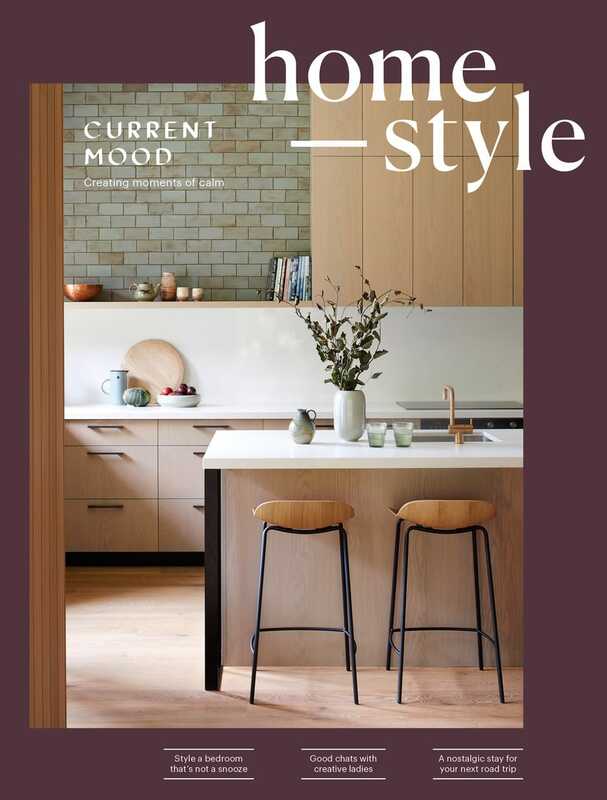 Whereas today’s open-plan living usually involves an expanse of unbroken flooring, here the rimu tongue-and-groove is celebrated but segmented. “Megson created ‘rooms’ by using a change in level,” explains Elspeth. TOP Jimmy’s cousin, fine-art photographer Casey Moore, created the butterfly artwork that hangs on the home’s spine. 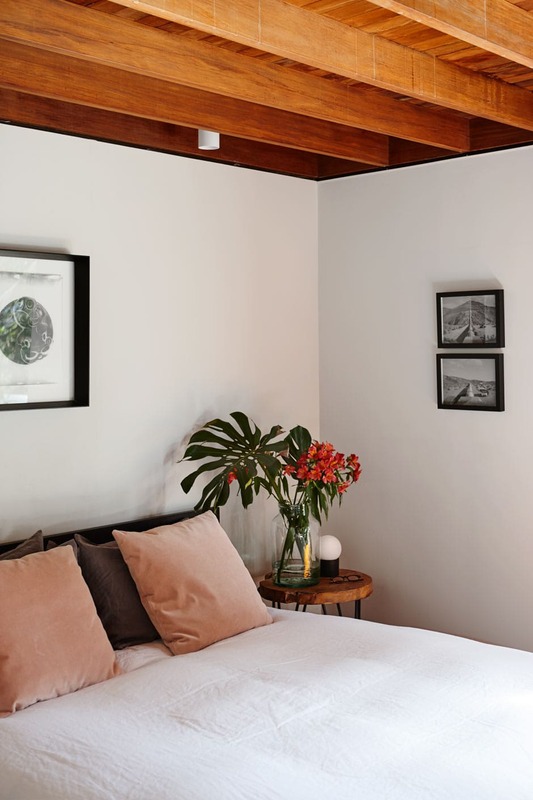 ABOVE Exposed rimu rafters bring textural depth to the bedroom, where a work by Christchurch photography teacher Juliet Collins (left) and photographs by Jimmy’s brother-in-law Will Vink adorn the walls. 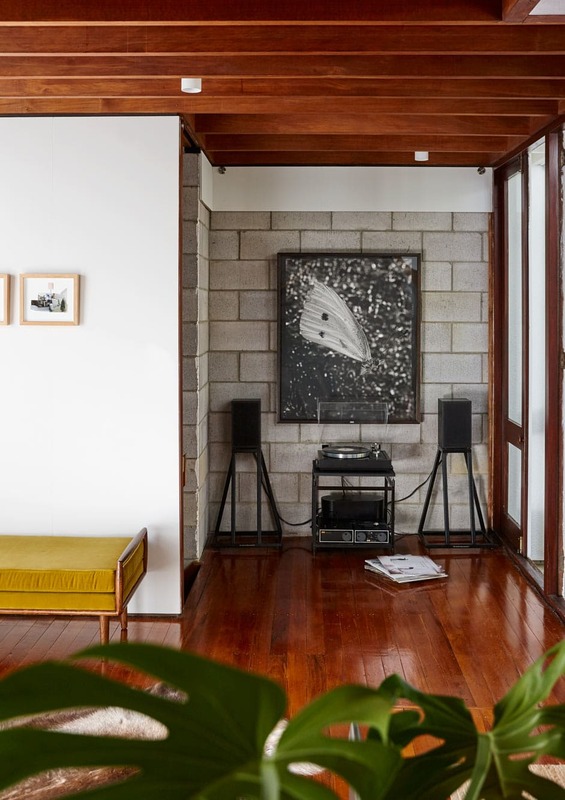 Unexpected design moves include a concrete-block fireplace that doesn’t quite meet the external wall, leaving a small gap. “The fireplace was capped off, so we don’t use it, but it’s a good mass in the middle of the space and partitions off the living room,” says Jimmy. Another wall cleaves a narrow corridor leading from bedroom to kitchen. The Grays enjoy these foibles — and the extra wall space because they both love art. 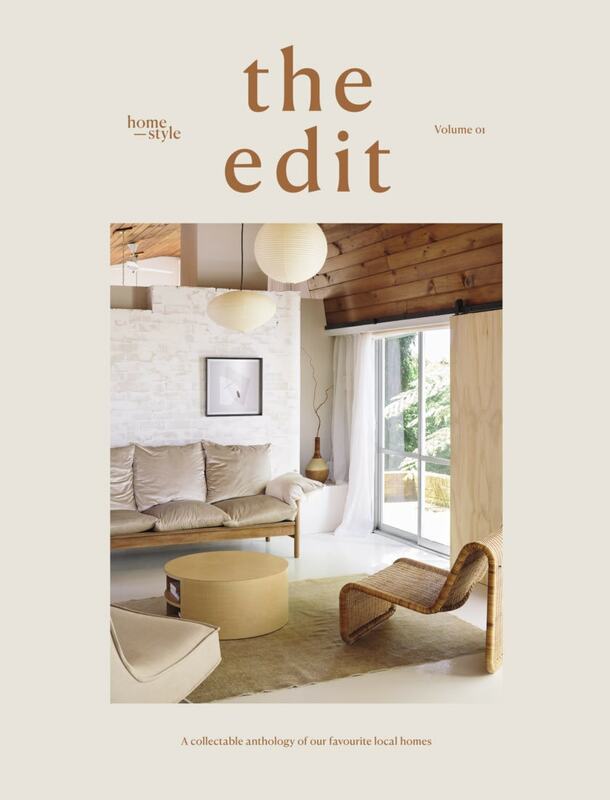 Much of theirs is sourced from family, including a silver bromide of a butterfly, an aerial photograph of the Wanaka headland where they married, and a triptych collage of elements of this, their first home. 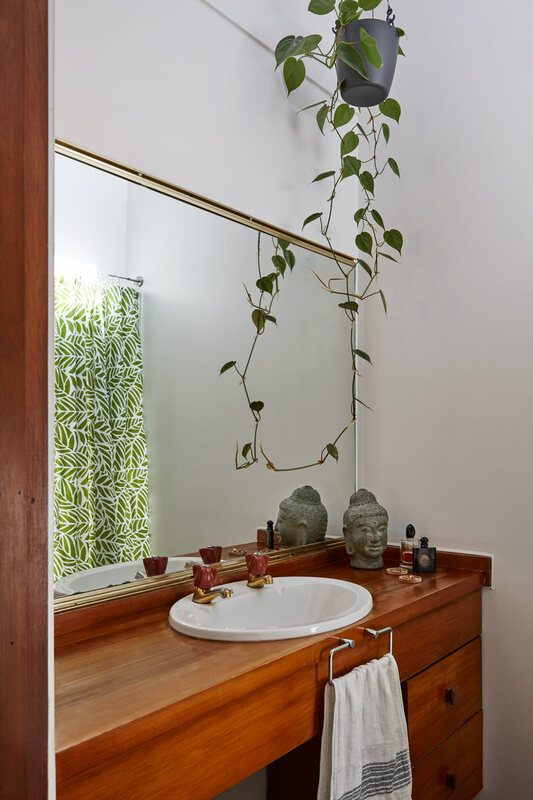 ABOVE Houseplants thrive in the light, humid original bathroom. 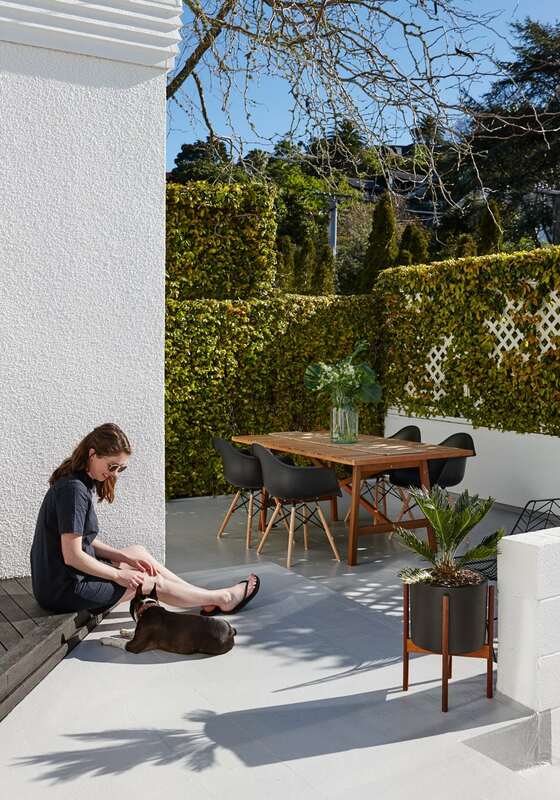 Once an overgrown slope, the back garden was tackled one weekend when Elspeth’s mum and sister came round for a working bee. Now it sports tropical clivia, nikau palms and ligularia. 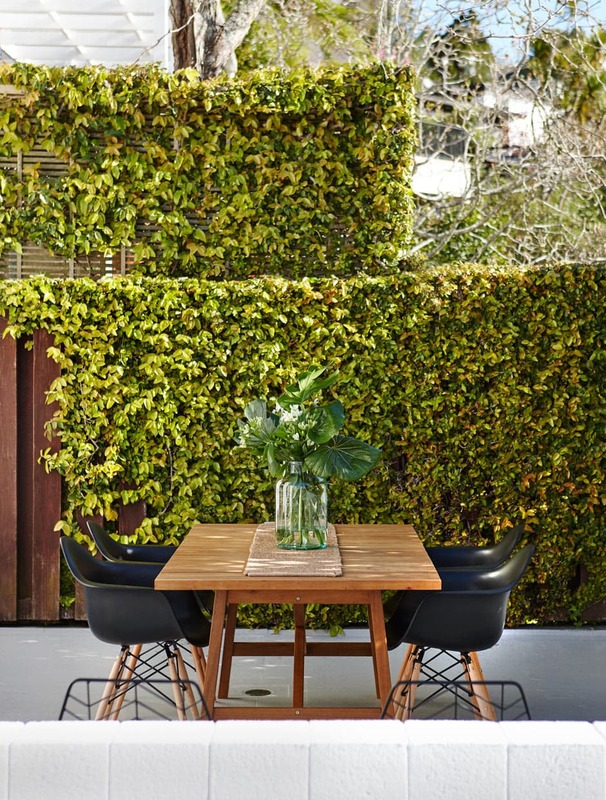 Inside, a monstera plant and other mid-century foliage favourites provide splashes of green. When they moved in, Elspeth and Jimmy discovered that a circular table they’d received as a wedding gift fit perfectly beneath the ‘lantern’; sadly, the same could not be said for their leather sofa, which turned out to be a tad longer than the living room wall. No matter, they happily made concessions, like choosing a Boston terrier named Brooks to become part of the family (he’s the ideal size for a small space) and committing to keeping on top of the tidying up. ABOVE The couple move their cycad in its Case Study planter around seasonally to catch the best sun. The trouble is, with a baby on the way, the couple couldn’t justify adding a second bedroom. “We couldn’t bring ourselves to change Megson’s vision,” says Jimmy. A friend’s ‘helpful’ suggestion of installing a pulley to lever the young ’un to a sleeping ledge in the bathroom was out of the question — they decided to sell.